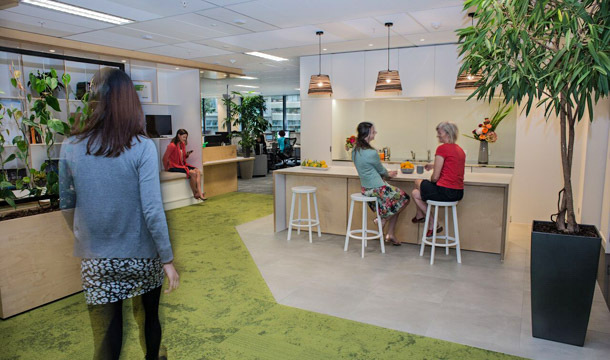 The New Zealand Green Building Council (NZGBC) has achieved a 5 Green Star rating for its Queen Street office fit-out. 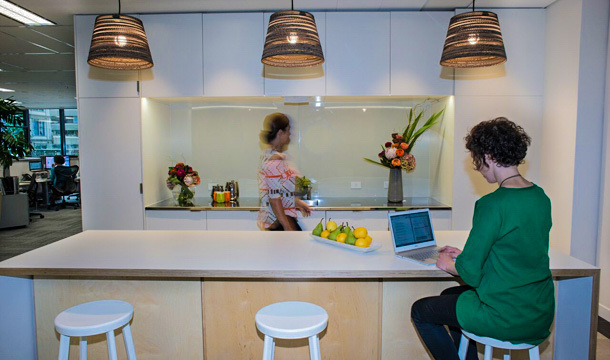 “Because of the choices we’ve made, our office uses less energy and water, and promotes health and productivity with great internal air quality,” says NZGBC Chief Executive Alex Cutler. Although NZGBC certifies Green Star ratings, it was subject to the same independent, robust process all projects experience: two assessors worked on the submission, and an independent chair ran the assessment meeting. Energy – lighting was reduced (from 56 light fittings to 20) and re-designed with presence detectors; new lights are either high-efficiency lights or LEDs. The fridge, dishwasher and IT hardware are Energy Star rated. There is also a real-time energy monitoring display to help NZGBC track and improve energy efficiency. Water – the dishwasher and hot-water dispenser were chosen for their high water-efficiency ratings. 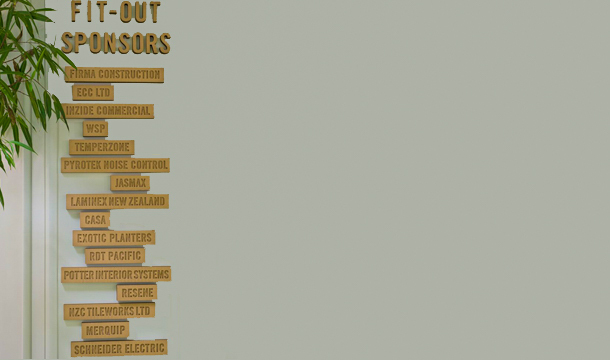 Materials – office furniture and computers were reused; any new furniture or cabinetry is certified by a recognised eco label. Existing Green Tag-certified carpet tiles were supplemented with new low-VOC carpet made from recycled fishing nets. Walls and doors were painted with low-VOC, Environmental Choice NZ-certified product. Waste is separated and recycled, and food scraps are composted. 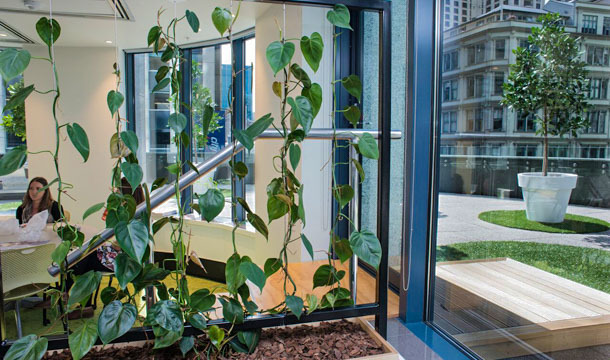 Indoor Environment Quality – the office features planter pots and two small climbing walls; species were selected to help filter particles and toxins from the air. A separate air-conditioning unit was installed to regulate the temperature and provide fresh air in the new training rooms. The photocopier room has a dedicated exhaust to remove toxins. Emissions – NZGBC’s office is in a building with a 5 Green Star Design rating, which means the bathrooms already has low-flow water fittings. The insulation selected had zero ozone depletion potential and was certified by Environmental Choice NZ. Innovation – two Innovation points were awarded. One was for exceeding the benchmark in the number of plants; the other was for providing learning resources, such as the energy-monitoring display and information cards around the office. Management – construction and demolition waste was minimised and separated on-site, according to a strict waste management plan. Recycling is measured, and eco-friendly cleaning products are used. NZGBC also included environmental management clauses within their lease with the landlord. Transport – NZGBC chose an office that was close to mass transport and many of its members. Though they had a wide range of industry knowledge at their disposal, Cutler says working within their limited budget was still a challenge. “We’re very grateful to our fit-out sponsors, who helped with products and services to make our office a great place to work and for members to visit,” she says. RDT Pacific’s recognised expertise in the process of managing fit-outs was a huge boost in ensuring we met our extremely tight deadlines in a timely fashion. In addition, their knowledge and experience in the sustainability space meant that they could fully anticipate what we would need to do to achieve our Interiors rating. The end result was a 5 Green Star Interiors rating, a timely move into our new office and on-budget delivery. And a happy client.